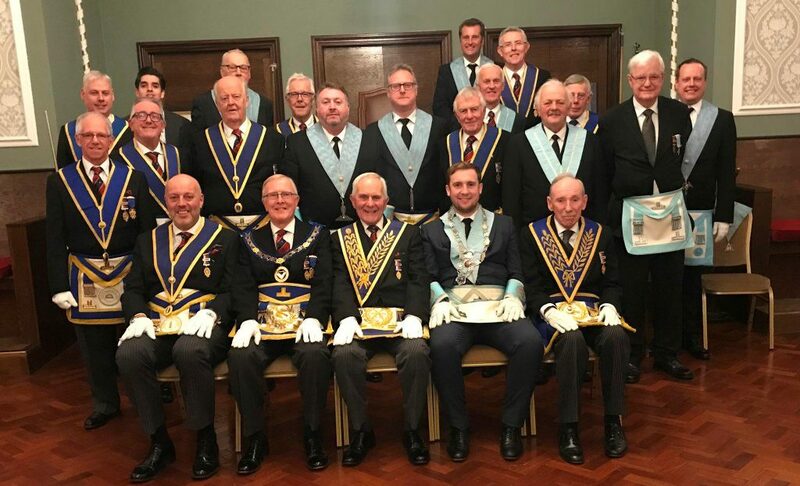 On 22nd November 2018 at Commonweal Lodge No 5332 the Brethren celebrated the 50thanniversary of the Initiation of Peter Humphreys into Freemasonry. After the opening of the Lodge and the formal business dealt with, there was a report. WBro John Curry, Provincial Deputy Grand Director of Ceremonies entered the Lodge and announced that WBro Chris Welton, the Assistant Provincial Grand Master for the Manchester Districts, accompanied by a District Deputation was outside the lodge and that he sought admission. On entering the Lodge, the Worshipful Master, Bro Gerard Long, offered the gavel to WBro Welton who was very pleased to accept it. Having taken the Master’s Chair, the Assistant Provincial Grand Master proceeded to introduce his District Deputation, which included: WBro Paul O’Carroll, Chairman City Derby, WBro Mel Rosenthal, Secretary City Derby, WBro Chris Wildman Deputy Chairman City Sykes, WBro Richard Zoltie Manchester Area Communications Officer and WBro Andrew Greenhalgh, Royal Arch District Officer. WBro Humphreys was placed in the centre of the lodge by the Lodge’s Director of Ceremonies and the Deputy Provincial Grand Director of Ceremonies and WBro Welton began by first recalling the significant events that occurred in 1943, the year of Peter’s birth, and then those that occurred in the year he was initiated into Freemasonry, 1968. In 1943, George VI was King, Britain was at war and Winston Churchill was the Prime Minister. The Allies captured Tripoli and Tunis in North Africa and invaded Italy. Also born in that year were Cilla Black, Terry Venables, Mick Jagger, George Harrison, John Major and Billie Jean King. In the year of his initiation, 1968, Manchester United won the European Cup and Manchester City won the First Division. London Bridge was sold for £1,029,000. Apollo 8 became the first manned spacecraft to orbit the moon; the “Airbag” and The Big Mac were introduced. Tony Roche and Billie Jean King won the singles titles at Wimbledon. WBro Whitton then delivered a moving tribute to WBro Humphreys. Peter has been married to Valerie Ann for over 48 years. They have 3 children and 6 grandchildren. He spends his time attending to his large garden and very much enjoys walking, particularly in the Lake District. WBro Humphreys trained as a Chartered Accountant and worked in his father’s firm in Manchester. After 8 years he left the profession to work with his Brother-in-Law in a fruit business, but he returned to the Accountancy profession in 1986 where he stayed until his retirement in 2007. Peter has a distinguished Masonic pedigree. His grandfather was Deputy Provincial Grand Master of Lincolnshire Province and his father was Provincial Junior Grand Warden, at one time, also in Lincolnshire. He recalled that Peter was initiated into Landmark Lodge No 5411 in 1968 and was WM in 1977 and also in 1992. He also served as Secretary, Treasurer and DC on at least two occasions. He was appointed a Provincial Grand Steward in the late 1980s and subsequently promoted to PProvSGD and later to PProvJGW. In Commonweal Lodge, WBro Humphreys was the WM in 2009 and 2015. In the mid-1990s, Peter was invited to become Deputy Chairman of Manchester District No 8 and at that time he initiated WBro Whitton. Later he became Chairman of No 8 District until it was disbanded and he received Grand Honours as PAGSwdBr. Peter was also honoured in Chapter with the Rank of PProvGSoj in 1990 and promoted to PProvGSwdBr in 1999. WBro Welton then paid a few more tributes to WBro Peter Humphreys. He described him as “a special man”. He thanked him for his constant and profound support of Freemasonry and his Lodges for over 50 years. 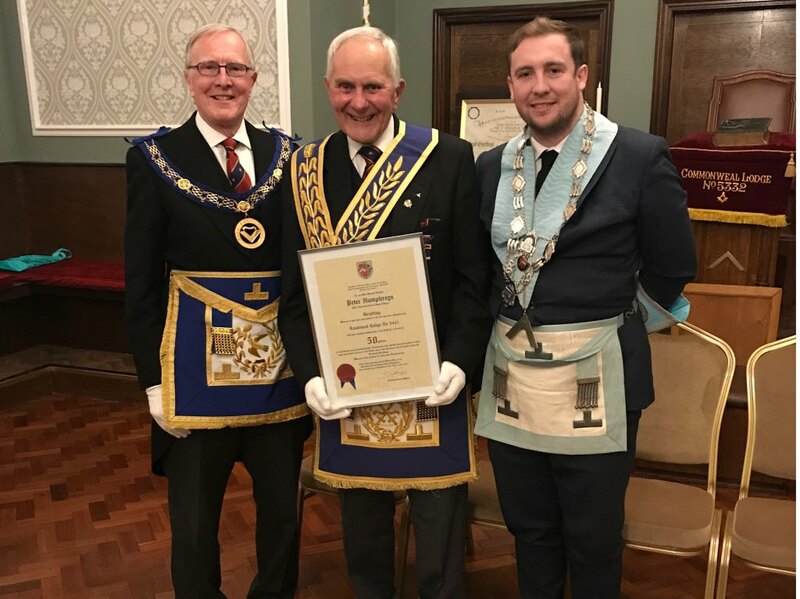 WBro Chris Welton presented the celebrant with his 50 Year Certificate and a personal letter from the Provincial Grand Master, Sir David Tripper, before being perambulated around the lodge room to the rapturous applause of the brethren assembled. Once seated again, WBro Paul O’Carroll, City Derby District Chairman, presented WBro Humphreys with a 50 Year Lapel Pin and congratulated him on this momentous achievement. After the lodge had closed, the members of Commonweal Lodge hosted a warm and very enjoyable social board.